I have been craving a lot of Indonesian food lately, partly because I miss it. In Sydney, I would have it at least twice a week, either Mum’s delicious cooking or we would go out to an Indonesian restaurant. So when J mentioned that Kudos, a restaurant in Crowne Plaza, was having an Indonesian themed buffet, I couldn’t resist but say yes! I was glad that it wasn’t just Indonesian food that evening, (you’ll see why) but there were also Japanese, Western and Seafood! Since it was ‘Indonesian’ themed buffet, I thought I would start with the Indonesian dishes. My first plate of food consisted of Sate Ayam (chicken) and babi (pork), which was ok, the sauce was quite authentic, the chicken tender but thought the pork was a tad dry. The beef rendang was extremely weird, they didn’t use beef chunks or tendons, but beef ribs? The sauce was curry like, and the beef were a little dry and chewy. The fruit rujak which consists of cucumber, pineapple, tofu were incredibly yummy. I think the fruit rujak was definitely my favourite on that plate! 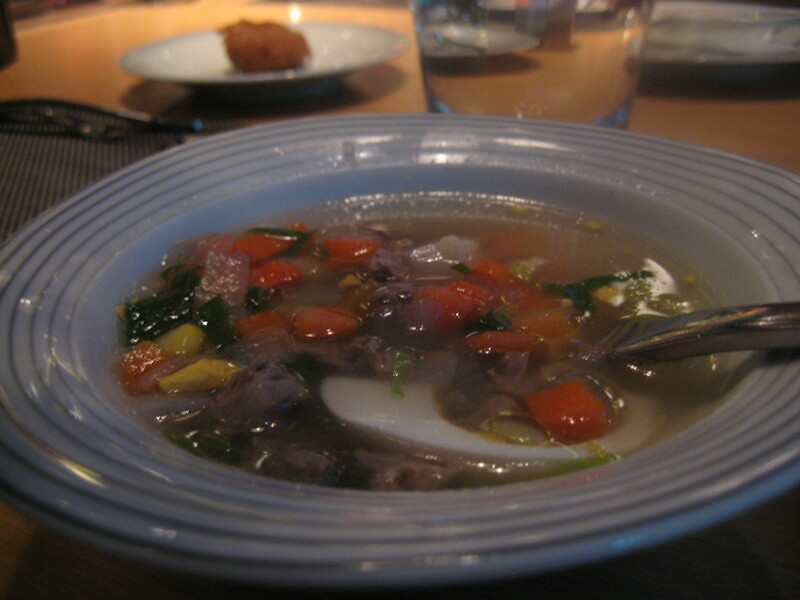 R got a bowl of sop sapi (beef soup), it looked ok but it didn’t taste ‘ok’. It was extremely watery and consist of MSG – a LOT of MSG, ‘MSG hot water’ was what they should have called it! I couldn’t even drink the soup – it was that bad. 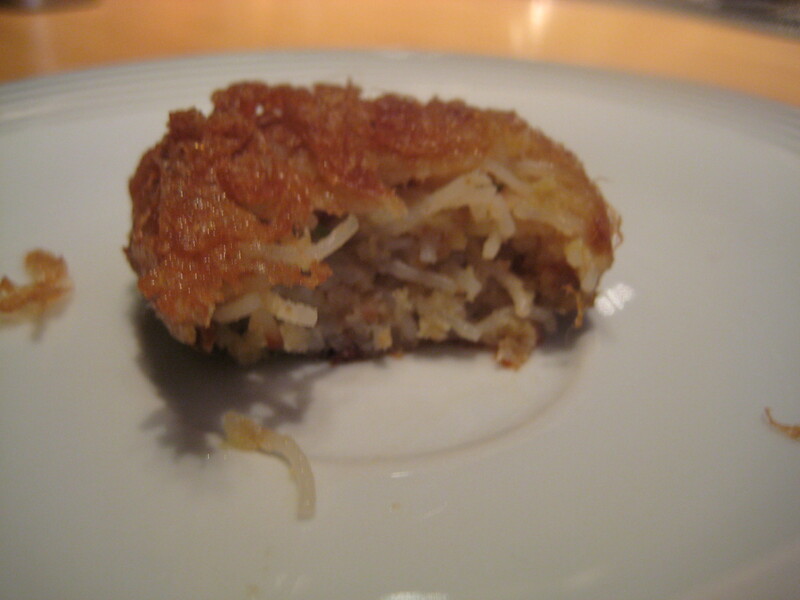 They had perkedel – it looked good but it was far from ‘good’. It was made from vermicelli and tofu! The texture was weird, this is not how perkedel is made! I was far from impressed. R and J tried the gado-gado, I didn’t even bother trying it as it looked extremely unappetizing and I was right. They both said it was horrible. Considering how unimpressed I was with the Indonesian food, I decided to try something else, Seafood! 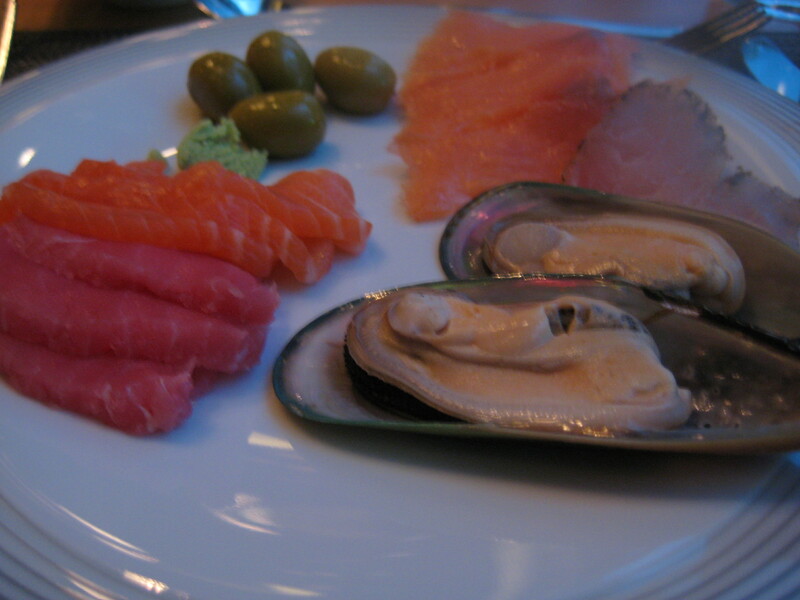 The salmon sashimi and tuna sashimi were incredibly fresh and tasty! The smoke salmon, mussels, olives were delicious – not eaten together of course, but a lot better than the Indonesian dishes! 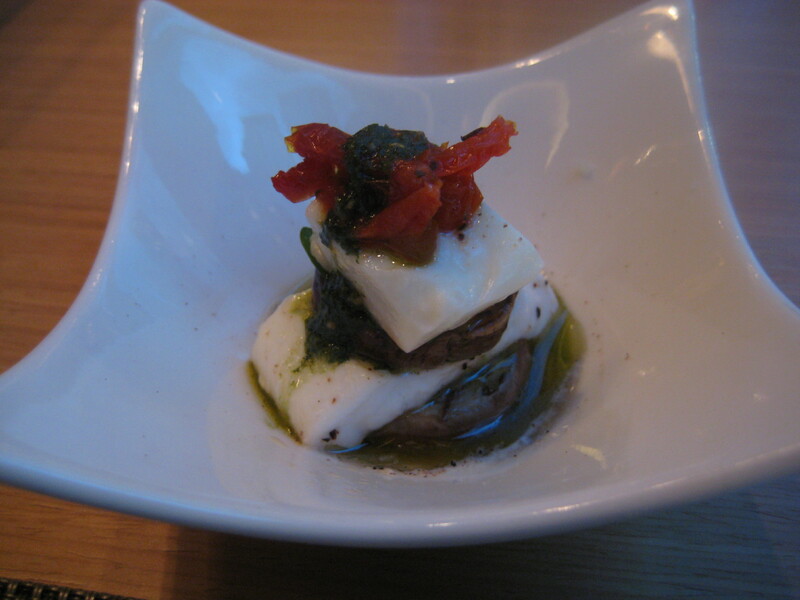 Marinated mushroom with mozzarella cheese was fantastic. Topped with sundried tomato and pesto, it was a simple but yet satisfying dish. The oysters were fresh, I could have easily eaten a dozen of these. However, they were brought out to us and I only managed to eat one! 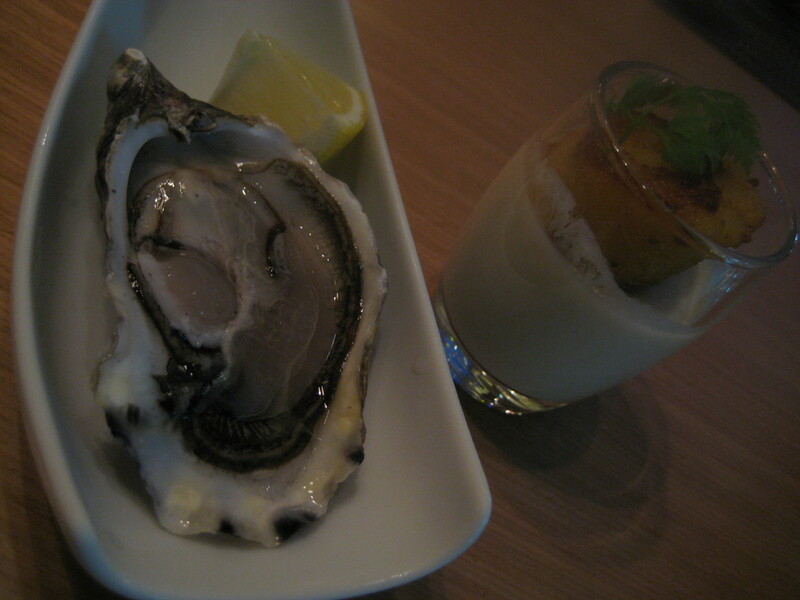 The shot glass was pan fried scallop with cauliflower and corn puree. I thought the scallop was a little dry, over cooked, but the cauliflower puree was creamy and delicious with a hint of corn. R, J and Sc had a bowl of wontons, I was getting full and was ready for dessert, however, managed to steal a wonton from R and tried the soup. 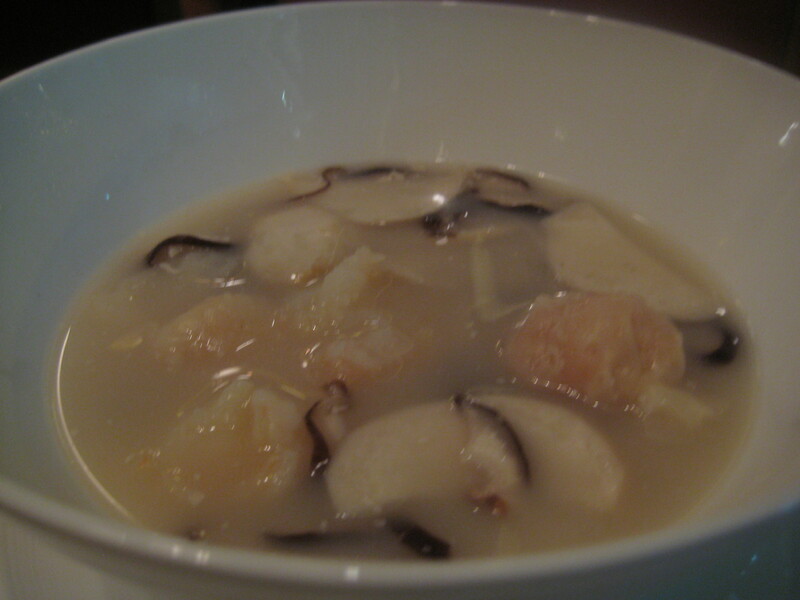 The wontons were great but soup I thought was too salty. Now… desserts…. 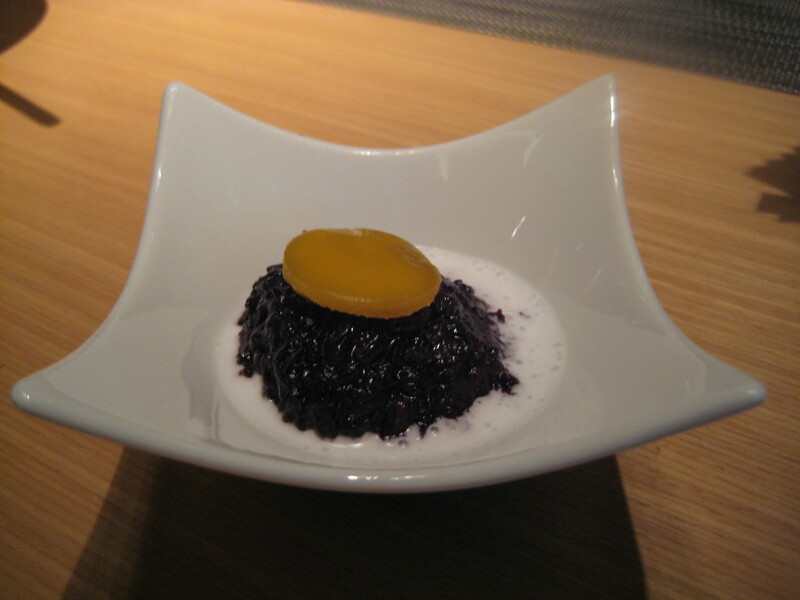 Ketan item, which is black rice pudding. The black rice was extremely dry and hard, even with the coconut. I only had one mouthful, it wasn’t great unfortunately. R and I thought we would get a mixture of shot glasses desserts. R got the tall glasses and I got the short glasses. On R’s plate, cendol, which was ordinary, the cendol was hard and too sweet for my liking. The tall shot glasses – chocolate mousse – oh my gosh – it was absolutely delicious, chocolatey, creamy and smooth! Then mango pudding – was way too sweet. The red syrup with de coco was also a little too sweet for my liking. 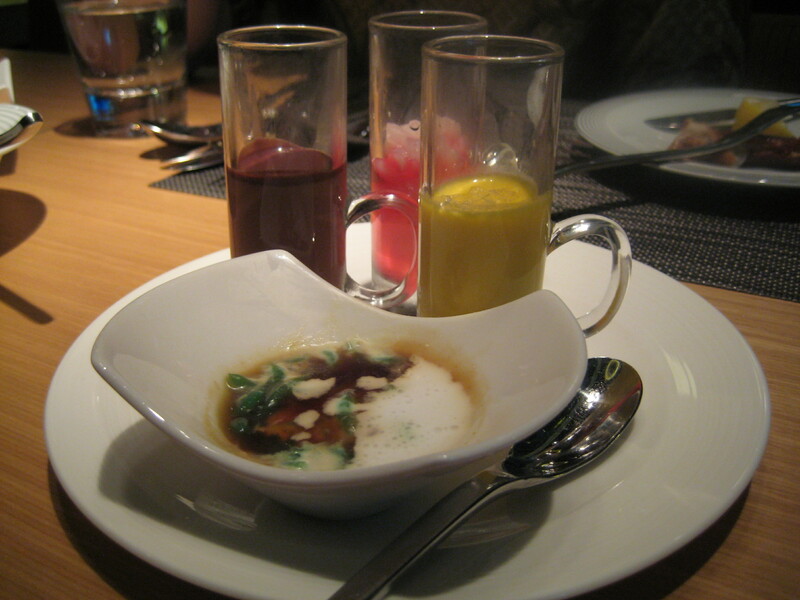 The short shot glasses (starting from the left) – guava jelly, not a huge fan, as I am not a fan of guava. 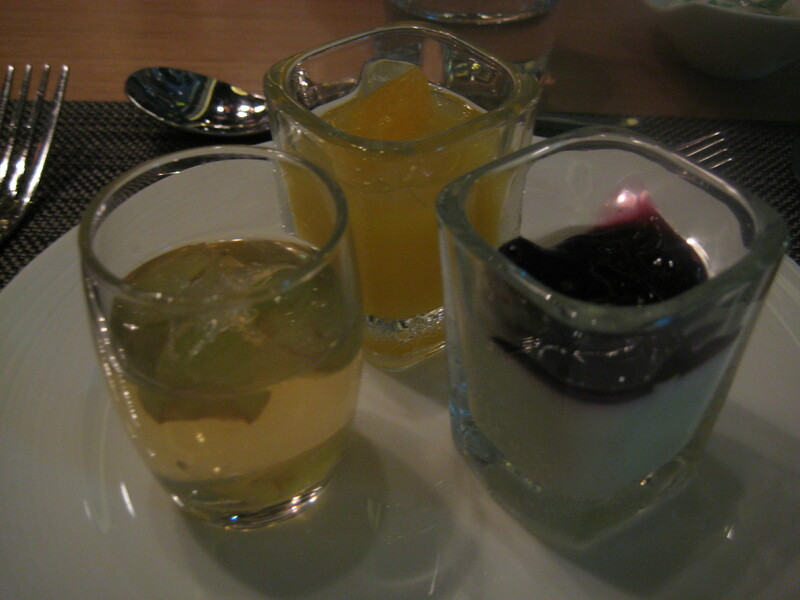 Mango jelly with fresh mango was ok, nothing special, and last but not least, the blueberry custard, I thoroughly enjoyed it, it was sweet and creamy! The sourness from the blueberries gave it a nice touch. This was the first highlight of the evening – pisang goreng – fried banana fritters. I miss Mum’s pisang goreng! I am embarrassed to admit this, but I am quite certain I had 3 servings of this. 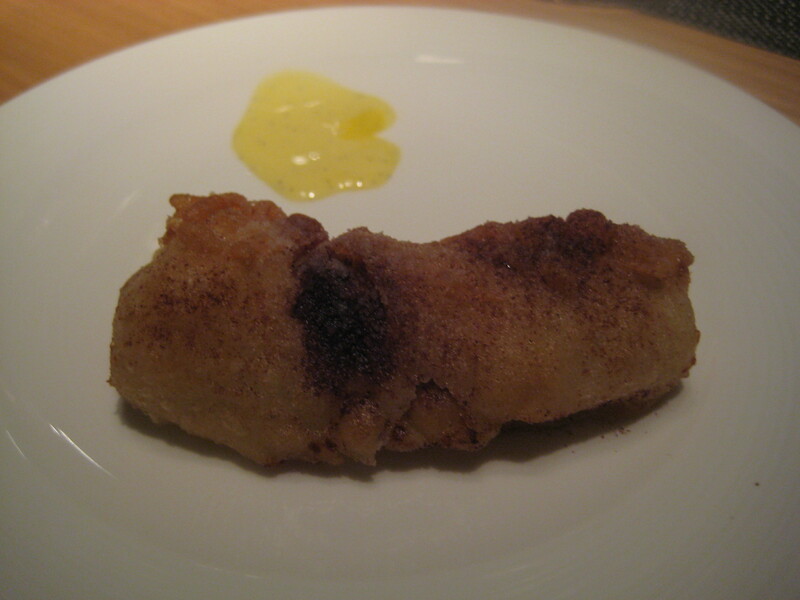 The fritters were hot, banana moist and sprinkled with cinnamon it was absolutely delicious. Oh how I missed thee! 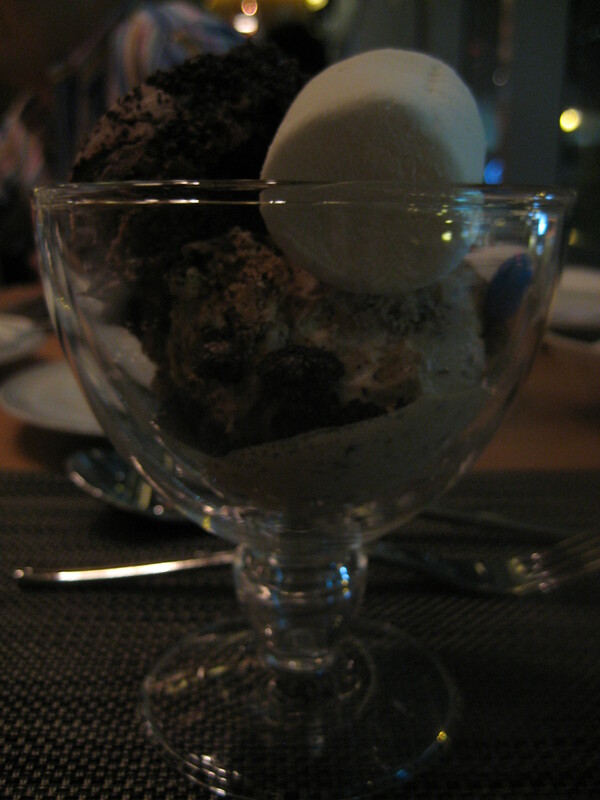 The second and last highlight of the evening – Movenpick ice cream! I was stuffed by this stage but couldn’t help myself to a couple spoons of J’s. OH MY… Movenpick! J put chocolate sprinkles on his chocolate ice cream and my my… He kept giving me dirty looks as he was on the phone and I was eating all his ice cream! Sorry J! But who doesn’t like ice cream right? 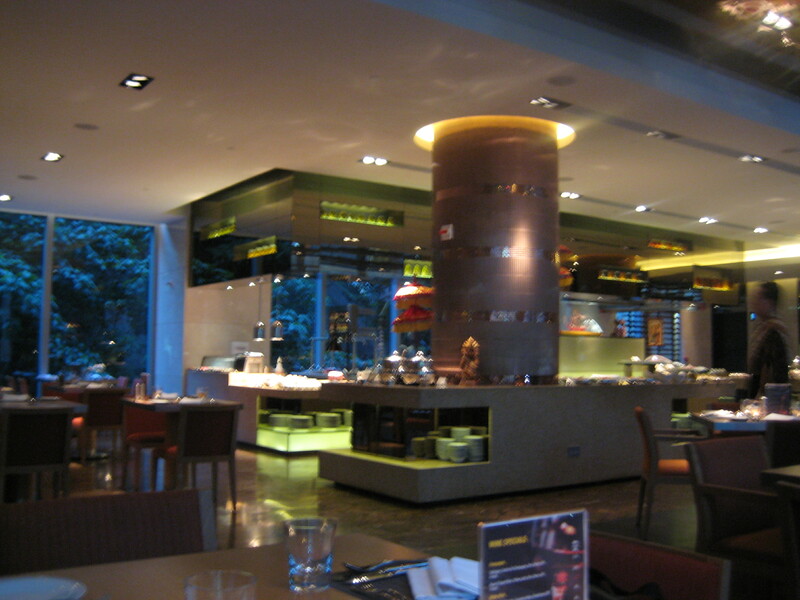 It wasn’t the best buffet I have had, and at HKD 400 (or close to it) you would expect it to be ‘good’. 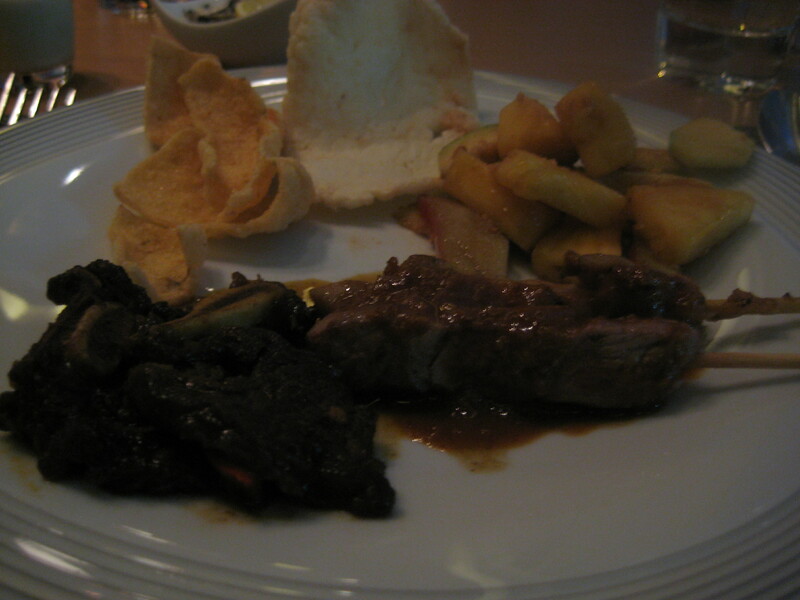 I was far from impressed with the Indonesian food, especially since they claimed the flew in a famous Indonesian chef. For me, the highlights would have to be the non-Indonesian dishes and the desserts, especially the – pisang goreng and Movenpick ice cream. It was great catching up with J, R, Sc and G. The bad thing about going to a buffet (or some might say a good thing) is that you tend to over eat, which I am sure we all did!